I was led to becoming an artist through a spiritual quest that began when I was a child and crystallized in the mid to late nineties. I never consciously intended to paint. I have always been intensely fascinated by the innermost workings of the universe, both physical and spiritual. I find similarities between the vastness of the ever expanding cosmos and freedom of mind. Strange as it seems I feel like I travel to other planes and dimensions. I sometimes have vivid dreams of other worlds and planets which seem to guide me. My paintings are proofs and accounts of my travels. 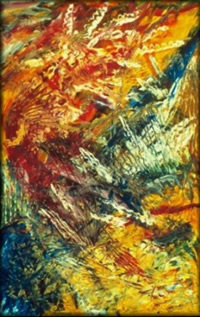 I paint from inner visions and intense emotions, impossible to organize in words, which I let go of instead on canvas. I seem to follow an inner guide, a wisdom or an internal muse that supplies me with tremendous joy and a wonderful feeling of long forgotten peace. My mother, Arlette Oger, was a wonderful artist and an art teacher. She influenced me greatly. My late uncle George Oger was also an artist. 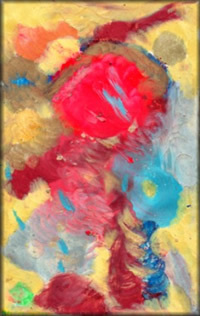 My work is for the most part expressive: abstract and abstract expressionistic with an intense and free use of color. I find peace when I escape the world of accepted forms and favor expressing myself freely and openly. Imagination and spiritual reflection is the closest I get to formlessness without limits . To imagine creating new worlds, new relationships. To work with the unseen, the un-interpreted and yet engender clarity, freedom and consequently evolution. I feel calm and focused enough to reveal to myself my most intimate thoughts when I engage in the act of painting. Painting to me IS thinking in action, profound and on all levels. My paintings are like books and maps. I "write" so much in them. I journey like a guided vessel through rich internal experiences removed from the psychological babbling of the "real" world. The work I did and continue to express as an actor and an acting teacher has influenced me greatly, so did my early childhood experiences. Aiming at voicing the universal and spiritual brings me closer to creation and a deep sense of wholeness, moreover it allows me to generate an unusual experience of freedom and peace, more long forgotten than unknown. I don't try to be a "painter" in that traditional sense, nor seek to please per se, nor do I try to judge what I do. I try not to push myself nor hold myself back. This process has been intensely freeing and immediately impacted my life in rich ways that I'm still absorbing and comprehending. Living in a political, delicate and sensitive world, I participate in the process of completely consuming the atmospheres around me in order to process them artistically. 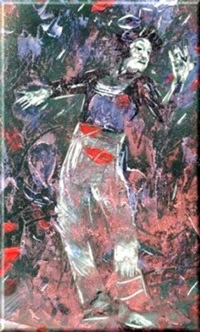 It took several decades to find the strength and courage to begin expressing myself fully in this medium. I first began doing pastels and later experimenting with digital art, before I started to use oils and various other media. Much of my recent progress emerged as a result of working with my good friend, most accomplished artist and well known art educator, Francis Coelho, who has shed much light on my ever developing artistic path. I like mixing media to produce unusual textures, shapes, compositions and color coordinations. I am interested in surprising dynamics, rhythms and relationships. I create series spontaneously based on techniques and ideas I have been subconsciously developing and refining over the years. They're finally hatching on canvas. I'm still pretty amazed with the whole process. I express myself in whatever form, mood, esthetic attitude, technique or time feels right, rather than premeditating a skillful rendition of an idea, an object or a concept. Ideas seem to occur naturally as part of the process. I firmly believe life and hence creativity flow freely through us if we allow it and do not block the channels. As much as I respect and make use of systems of interpretation, sophisticated criteria and fundamental rules in my approach to acting, I try my absolute best to escape all that when it comes to painting. I can't even explain why. I honestly like taking chances and trying new or unconventional ideas. A healthy criteria is essential to one's development but it can also deaden and be reduced to a bunch of old static rules nobody cared to revise or renew. Criteria is an organic thing that keeps evolving and should keep surprising and awaking me. I play a kind of cat and mouse game with principles. First I paint, then I see the principles that stick on canvas consistently. Courage and trust are my best friends in this case because I have tremendous respect for great tradition; the point is not to try and break rules for the sake of breaking rules. I aim at giving myself complete freedom of expression, style, technique, media and idea. I believe there is a "world" beyond interpretation (or is it judgment), that is probably why I attempt at fleeing obvious representation as it inevitably immobilizes and directs my vision. Painting and watching my work calms and reassures me. "Whatever you can do, or dream you can, begin it. Boldness has Genius, Power and Magic in it." One of my favorite quotes by Goethe.